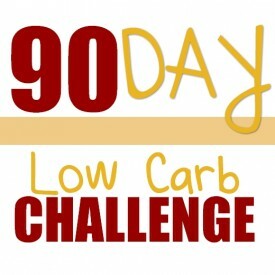 It’s time for the Week Two Weigh-In if you’re participating in the 2019 Keto Challenge! You can post your progress in the group thread, or here on this post if you prefer. It’s never too late to join in! See the challenge details here. I’ll be heading to LA in a few weeks to attend this amazing “keto science conference” and I want to bring YOUR questions with me! I’ve always been fascinated by the science behind the ketogenic diet, and even more so lately as I’ve been watching new research emerge and testing new things myself. There are so many recent developments in the research and clinical practice of keto medicine, most of which you just get bits & pieces of – and that’s if you happen to come across them on the web. And of course there’s tons of misinformation floating around online too, leaving people with A LOT of contradictions & questions! 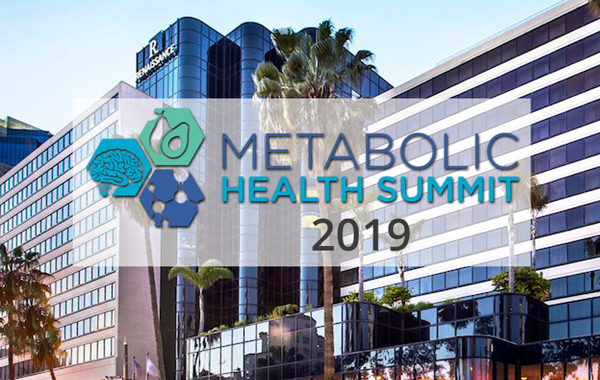 The Metabolic Health Summit is “where keto meets society.” They bring together the world’s most respected scientists and clinicians to share their research and their results in clinical studies on the ketogenic diet and various metabolic therapies. And much more, including weight loss and nutrition of course – covering the whole spectrum of keto science and therapeutic nutrition! What first piqued my interest in the event was a series of live videos and interviews leading up to this event, where they were specifically talking about Dementia and Alzheimer’s, and studies on the use of exogenous ketones to improve cognitive function in those patients. I’ve mentioned a few times that I’ve taken a HUGE interest in this after reconnecting with my father recently. This is a terrible picture of me lol, I was fresh off a day at the river! 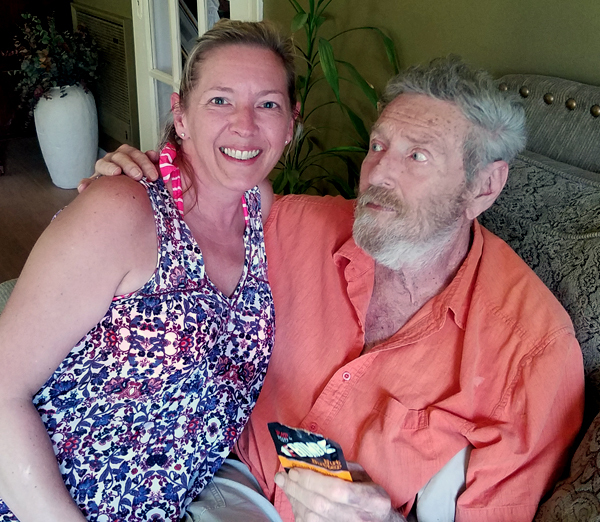 At the point that we reconnected last summer, he hadn’t eaten solid food in almost two years. I discovered though that he LOVES the all natural nut butter packets and I’ve been finding ways to get a variety of nutrients in him with my “keto stash” of liquid or soft foods! I was really inspired by the studies and results of a ketogenic diet for cognitive function in older patients in those studies, and have witnessed DRAMATIC improvements in my own father in short time too – specifically with his short term memory and level of alertness. 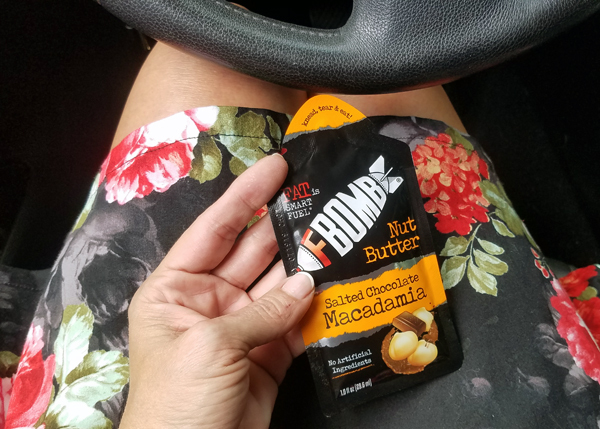 Some of the things that have worked well so far are the FBOMB Nut Butter Packets (his favorite! 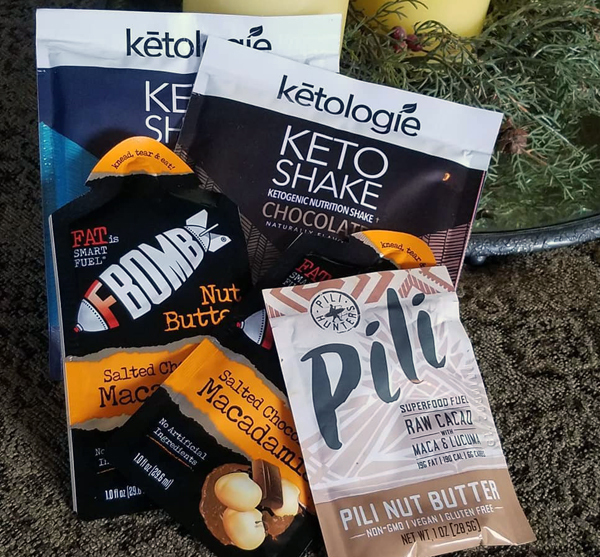 ), Ketologie Keto Shakes (which have collagen and MCT in them), and also Pili Nut Butter – which is made from a very nutrient dense nut. While I don’t expect to “save” my father, seeing IMPRESSIVE improvements in his cognitive function is both encouraging and interesting! At this point it’s all about daily health & happiness, or simply: quality of life. I think you’ll really ENJOY the Interviews and Educational Videos on their YouTube channel. I did! Those alone will answer A LOT of your burning questions on health issues as they relate to a ketogenic low carb diet (or vice versa). Those are the videos that really pulled me in, and encouraged me to do more testing – both on myself and on my father. The fast results have just piqued my interest even more! When I test a food, it takes me SIX FULL DAYS to do a clean keto testing experiment. When you’re doing true “clean testing” you only introduce ONE single new thing into your diet at a time. Since it can take up to 72 hours to fully metabolize the foods you eat, I will eat super simple for three full days prior to doing a test. This gets my body into optimal ketosis and at baseline levels. I then test ONE food, and otherwise continue eating super clean/simple for another three full days after. I use the Keto Mojo Glucose & Ketone Testing Kit and we have a 15% off discount coded in my affiliate link here. I love mine! This allows me to see how any given food or “keto product” affects me, impacts my blood glucose levels and ketone levels, and whether I experience any side effects from certain ingredients. 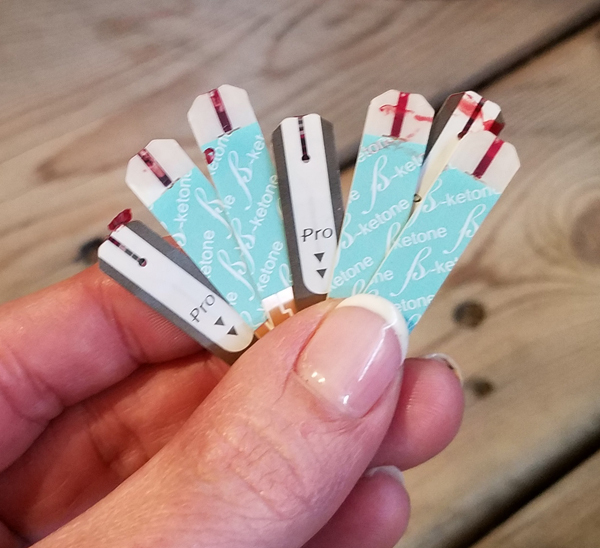 But by doing such a “clean test” I discovered that not only are her products VERY keto friendly, they actually *improved* my ketone levels! Most of the time I stick to simple foods that I know WORK for me: raw pecans, berries in moderation, eggs, salmon, meat and greens (plain, just salt & butter), etc. I’m interested to learn more from the case studies about the health benefits of intermittent fasting and also exogenous ketones (when to use them, and when NOT to). One of the things I’m SERIOUSLY considering testing next is an all liquid keto diet. I’m thinking I’d like to try it for maybe 3 full days – with various broths, shakes, and maybe the liquid nut butter packets as well. I suppose I went backward with this by not prefacing that first, lol – apologies. I’ve mentioned here and there I’ve had some issues over the last year. Not just with long periods of weight loss stalls and odd weight fluctuations (even in ketosis), but also with my overall health. Lately I’ve experienced inflammation again for example. But why? While I’m working with my doctor on all the “usual things” I’m also very interested to experiment myself – and learn more about gut health issues, ingredient triggers, the benefits of going dairy free or doing intermittent fasting, etc. So yes – I’m STOKED about the Metabolic Health Summit! I’ve been eating a ketogenic low carb diet for almost 8 years now, by the way. Even at my lowest weight, way below my goal weight actually, I continued “eating keto” for health reasons. I was in a near fatal car accident when I was 20 years old that resulted in a head trauma and back injury. I’m deaf on one side and have regressive memory loss, but worse than that was the chronic pain from my back injury. The older I got the less mobility I had as it turned into inflammatory arthritis, sciatica, and all the symptoms of fibromyalgia. Prior to switching to the keto diet there were days I couldn’t even lift my coffee cup to my mouth. I was in constant debilitating pain. I never in a million years would have dreamed that I could live a FUN active lifestyle again. It’s amazing to me how something as simple as your diet, the foods you eat, can impact your life SO much! So much more information is available now than ever has been before. All of my adult life I honestly just thought food was for eating and for enjoyment. The concept of “food as medicine” (outside of weight loss being a healthy thing) never actually occurred to me. What are YOUR biggest science & health questions or concerns as it relates to a ketogenic low carb diet? I’m curious: do you eat keto simply to lose weight or maintain your weight loss, or are you using nutritional ketosis for health reasons too – like I am? 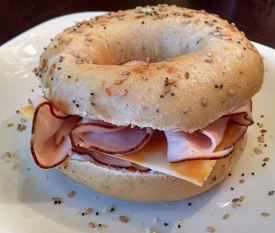 ← Keto Macros, Meals & Meetups: A Fun Day In My Low Carb Life! WHAT ARE THE EFFECTS OF HAVING CHEAT DAYS LIKE ON A HOLIDAY OR BIRTHDAY AND GETTING RIGHT BACK ON LOW CARBS? DOES IT RUIN ANY OF THE BENEFITS BESIDES GOING OUT OF KETOSIS ? 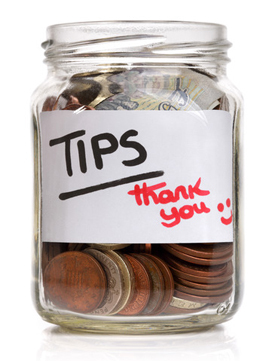 That depends on a lot of variables – first being how often you do it. There are always holidays, birthdays, special occasions, births, deaths, weddings, trips, parties, etc – plenty of “excuses” to eat junk food. As for me, I eat keto to stay out of chronic pain due to a lower back injury. The inflammation pinches my sciatic nerve so if I eat off plan I’m in debilitating pain and my feet and ankles swell to the point of total discomfort. So that’s not a pleasant result and definitely a deterrent for me personally, lol. I’ve done the Keto diet for s few years with great success of my own. I wanted to tell you about my son. He is 17, has been a high school football player. He’s always been healthy. When he wanted to enlist with the Army National Guard, he found out he needed to lose a little body fat. I helped him with the Keto plan, and he did a great job! He lost more body fat than needed, lost 9 pounds and feels great! Yesterday he was sworn into the National Guard and will go to basic training after high school graduation. What a beautiful story, Brenda – I can only imagine how proud you are of your son! And how easy was that, to drop the weight? 😉 Way to go! Wow… I’ve never heard of that, but your doctor REALLY thinks that could have happened so quickly, in two short months?! I would look up Dr. Ken Berry on YouTube and see if he addresses this topic. It sounds like it, Myrt! 😉 Did you watch the videos on their website? I found those VERY helpful. How is testing going so far?? I haven’t set up the app yet, but that’s next on my list! Are you using it? If so do you recommend it? Daughter and myself both had our gallbladder removed no issues. Can I Eat Keto Without a Gallbladder? I’m very interested in hearing what they say about the exogenous ketones and whether they are good for long term use, etc. and about any Keto news you can share!! Thank you! I’m interested in that topic as well, Linda. Up to this point I have avoided them altogether and am not sure why I would use them or what benefits there are – but I look forward to hearing more at the Summit! Looking a way to lower cholesterol. Hopefully you can get some information on this. I need to find a doctor that doesn’t want to push pills. I hope that proves helpful! I recommend looking up Dr. Ken Berry on YouTube as well and search his videos for that topic. He’s a doctor in my state here that I’ve met personally.